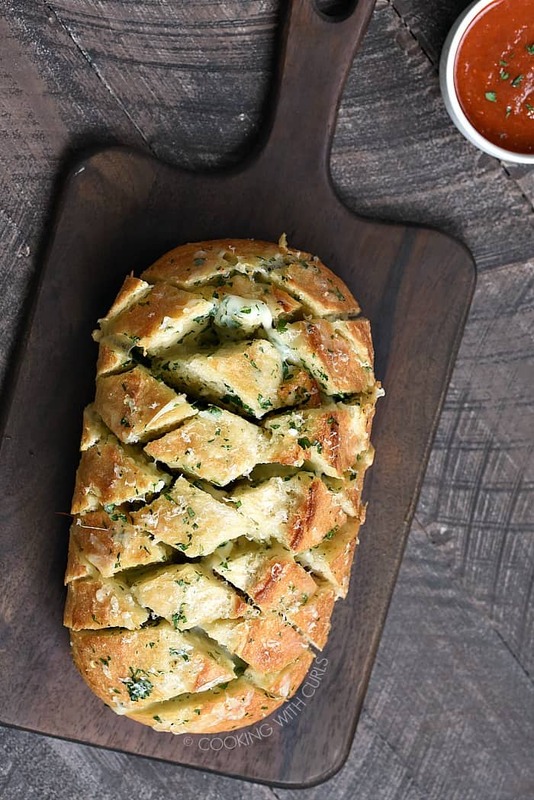 Cheesy Garlic Pull-Apart Bread is always a favorite on game day, at holiday parties, or even family dinner! 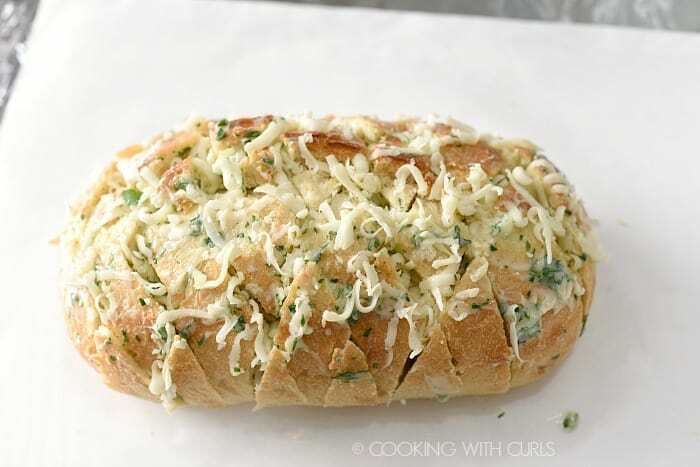 I mean think about it, who can resist crusty bread, garlic butter and loads of melted cheese? No one that I know! 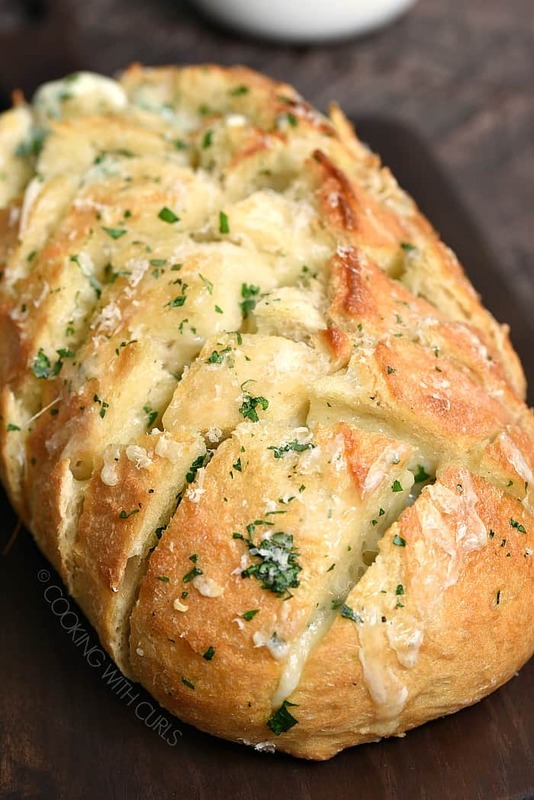 Best of of all, this Cheesy Garlic Pull-Apart Bread is super easy to prepare so you have no excuses not to make it…..
Whisk together the melted butter, garlic, salt, and parsley in a small bowl. 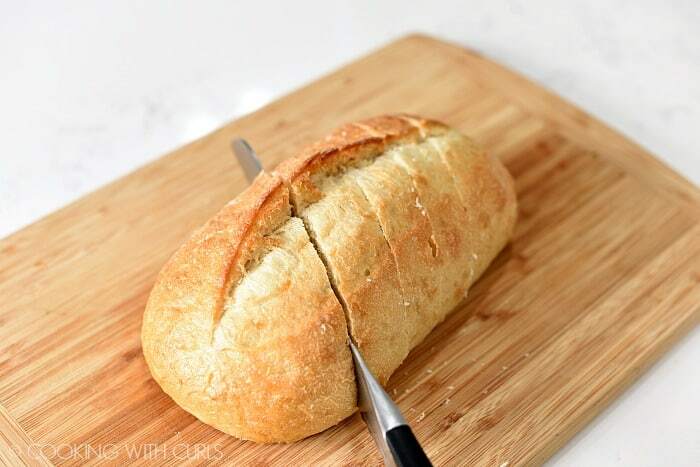 Set aside…..
Slice the bread on the diagonal with a serrated knife being careful not to slice all the way through…..
Flip the bread around and cut the opposite direction to form a diamond pattern…..
Place a large sheet of aluminum foil on a baking sheet, and top with a piece of parchment paper. Place the cut bread on top of the parchment paper. 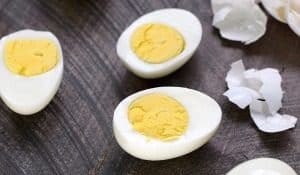 Spread the the slices of bread apart and drizzle with the butter mixture…..
Place the grated mozzarella cheese in between the slices…..
Wrap the bread inside the foil, covering all four sides. Bake for 15 minutes, until the cheese has melted. Unwrap the foil and bake for an additional 5 minutes, until edges start to brown. Remove from the oven and sprinkle with grated Parmesan….. 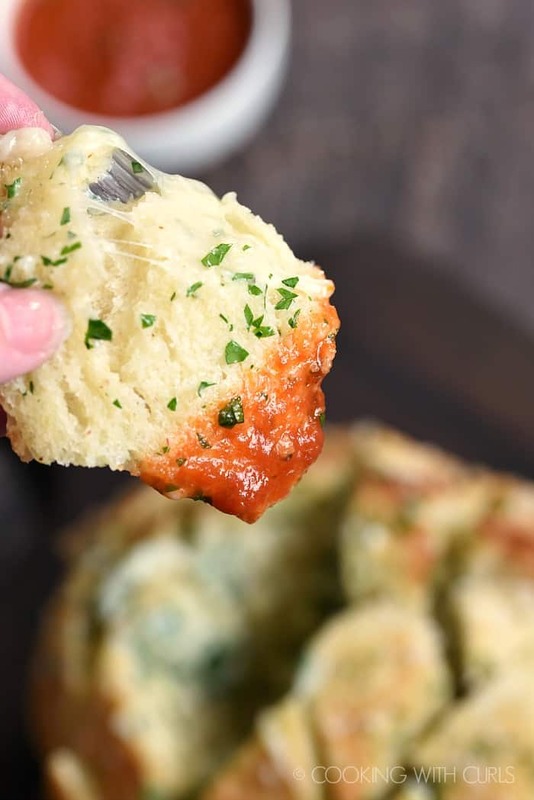 Serve with your favorite dipping sauce…..
You do not want to cut all the way through the bread or it will fall apart on you. 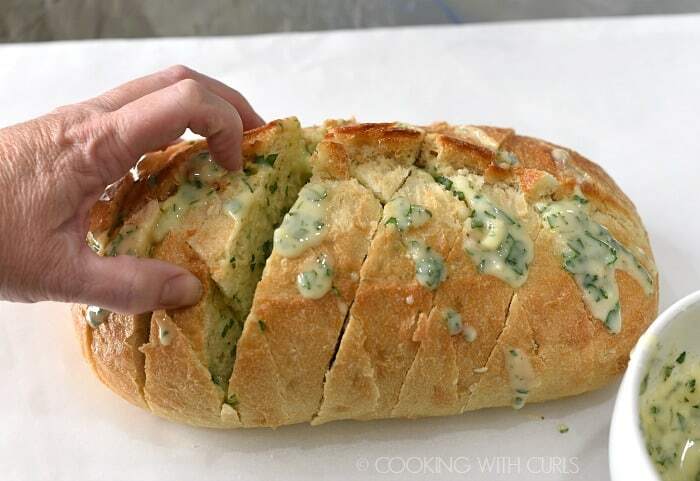 This also allows the melted garlic butter to collect on the bottom…YUM! To make ahead: Wrap the bread in the foil and place in the refrigerator overnight, or freeze for up to one month. 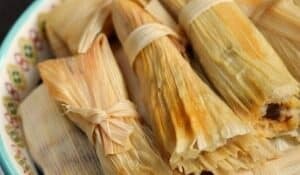 Allow to thaw before baking. 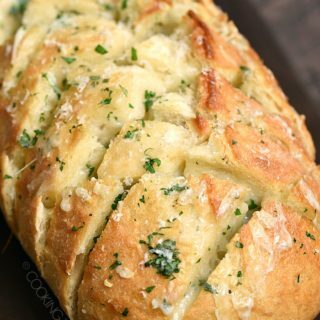 Garlic Dinner Rolls – Soooo soft and delicious! Homemade Soft Pretzel Bites – roll in garlic butter and sprinkle with Parmesan cheese instead of the cinnamon sugar. 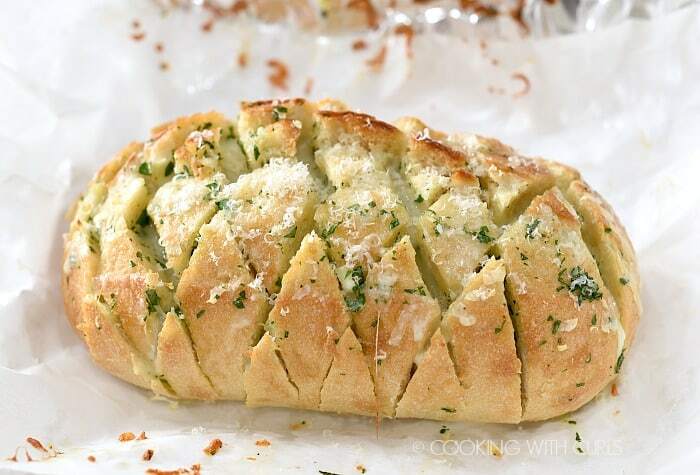 No one can resist this Cheesy Garlic Pull-Apart Bread fresh out of the oven! It's loaded with garlic, butter, and of course cheese!! 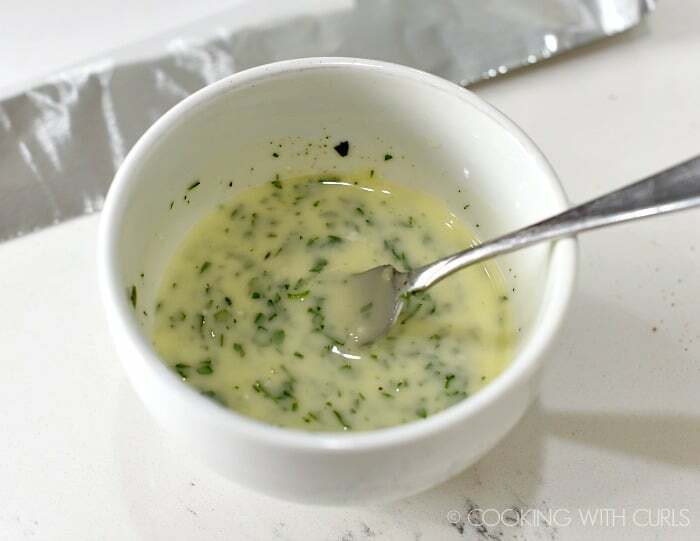 Whisk together the melted butter, garlic, salt, and parsley in a small bowl. Set aside. 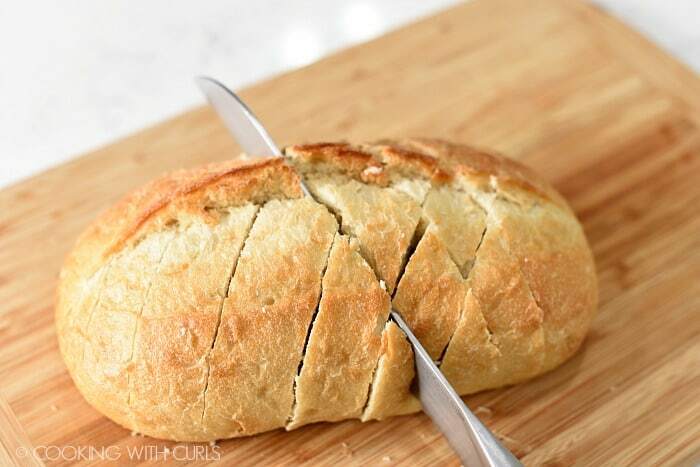 Slice the bread on the diagonal with a serrated knife being careful not to slice all the way through. Flip the bread around and cut the opposite direction to form a diamond pattern. Spread the the slices of bread apart and drizzle with the butter mixture. Place the grated mozzarella cheese in between the slices. Bake for 15 minutes, until the cheese has melted. Unwrap the foil and bake for an additional 5 minutes, until edges start to brown. Remove from the oven and sprinkle with grated Parmesan. Serve with your favorite dipping sauce. 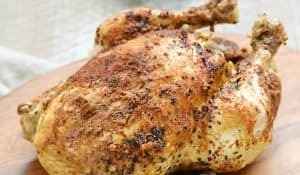 Sign up to get new recipes via email! You know you want one…..